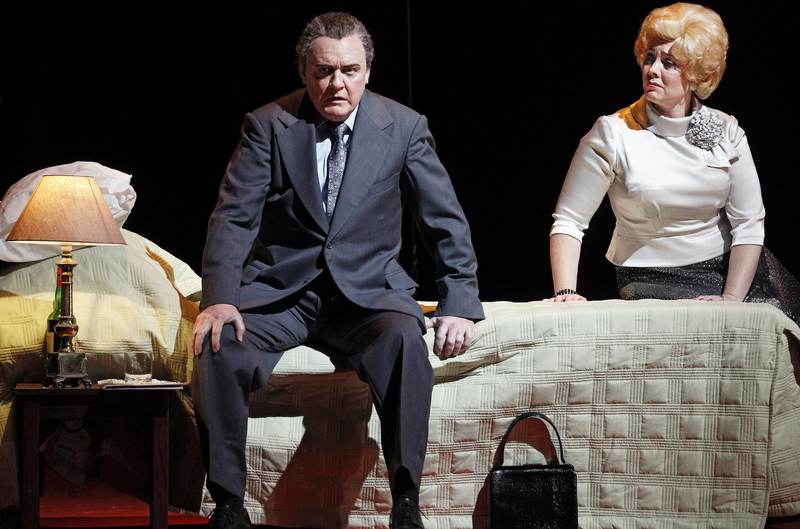 Opera Australia strays from the chocolate box favourites with this all too rare staging of Tchaikovsky’s Eugene Onegin, a presentation all the more precious for its ingenious concept and glorious singing. The rural Russian setting is largely traditional, but director Kasper Holten (Director of Royal Opera) greatly enhances the drama and emotion with layer upon layer of memory and meaning. In the overture, Onegin and Tatyana wordlessly preview their final scene, the entire opera then becoming a diorama of their recollections and regrets. Their capricious younger selves are woven in to scenes as a kind of dream Tatyana and dream Onegin. These roles are played by dancers Emily Ranford and Sam Colbey, who are choreographed by Signe Fabricus. 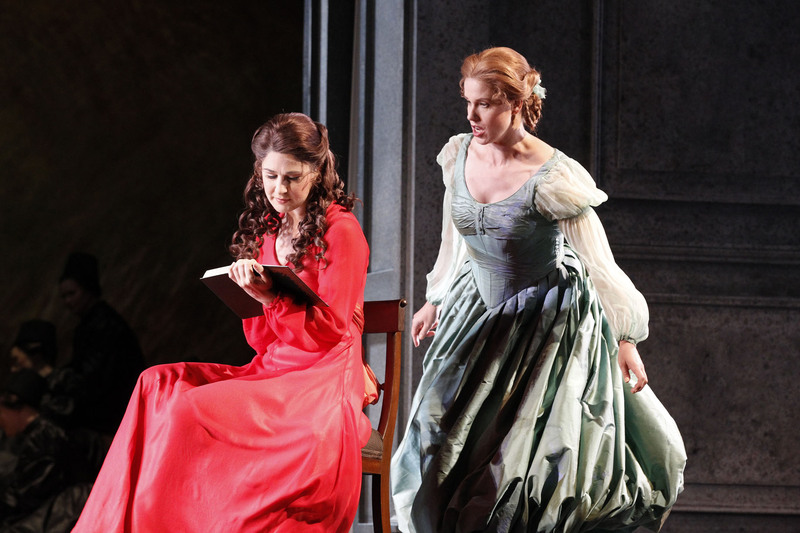 Older Tatyana watches her younger self write the letter of love to Onegin, wishing she could quell the impetuous passion of the starry-eyed young woman. 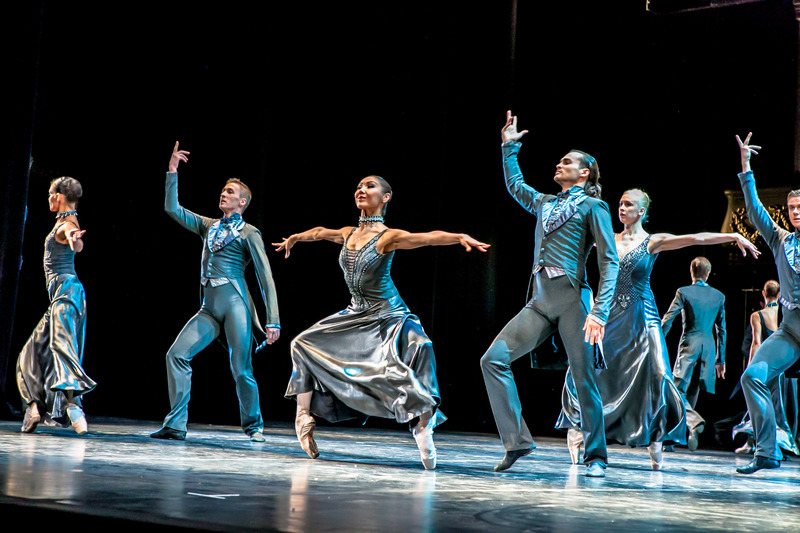 In a memory within a memory, the dancers reenact the shared passion of the pair, effectively the love-at-first-sight simplicity of the central love story. Older Onegin watches with regret and anguish as best friend Lensky sweats out the approaching duel, spirit Onegin goes so far as to throw himself in the path of the fateful bullet, such is his retrospective desire to save his dear friend. Holten has clearly mined the libretto, and music, for meaning and significance. After the peasant’s folk song of scene one, Tatyana proclaims that these songs make her dream of love, a dream we have just witnessed as Young Tatyana and Onegin danced and flirted about the stage. Out of her dreams, Tatyana’s love materialises in person shortly after this. When the foreshadowed final scene finally plays out, the stage is littered with collected debris that lead to that moment, including the dead body of Lensky. Costumes, by Katrina Lindsay, have a glossy theatrical edge whilst still portraying the largely working class stations of the characters. A clear highlight is Tatyana’s pair of costumes, which change her entire silhouette from slip of a girl in red to mature woman of means in white ruffles. In another clever touch, a small addition to the top of the red dress changes it to a smart party frock. 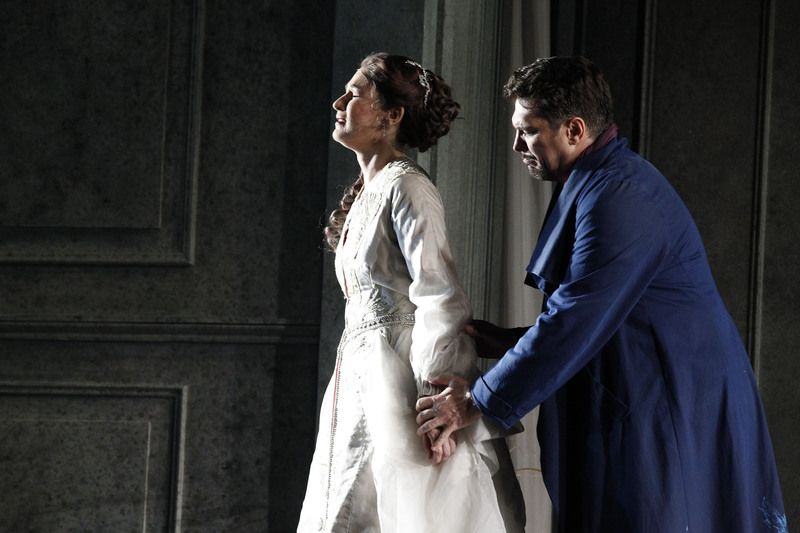 Onegin’s blue jacket is striking but the loose cut does not quite make him the dashing figure he could be. The dark tones of Madame Larina’s gown match the workers’ attire, showing a respect and restraint in this wealthy widower. Nurse Filippyevna’s practical outfit is set off with touches of witty flair in the fabrics and colours. Mention must be made of Wolfgang Goebbel’s expert lighting which greatly enhances both the storytelling and the visual appeal. Tatyana’s love-at-first-sight meeting with Onegin leaves her bathed in light as she basks in the wonder of this handsome newcomer. Weather and time are clearly conveyed, with clever use of silhouette and shadow also featured. In addition to a beautiful set of arias, it is Tchaikovsky’s dance music for Eugene Onegin that really distinguishes the opera. Maestro Guillaume Tourniaire leads Orchestra Victoria in a thrilling performance of the score. The orchestra’s nimble agility and synchronicity are in outstanding form as the motifs and melodies fly around the pit from section to section and instrument to instrument. Anthony Hunt’s preparation of the Opera Australia Chorus is reliably excellent, with diction and dynamics presented with impressive precision. Fast rising young Australian soprano Nicole Car cements her status as the one to watch with this breakout performance of breathtaking quality. Her luscious, full-bodied soprano is as expressive as it is gorgeous, and her strong acting skills allow her to create an endearing and heartbreaking characterisation of a passionate young woman. Future engagements are highly anticipated. Melbourne audiences are, for a change, favoured in the casting, with Tony Award-winner (South Pacific) and frequent Met Opera singer Paulo Szot visiting to play Onegin. 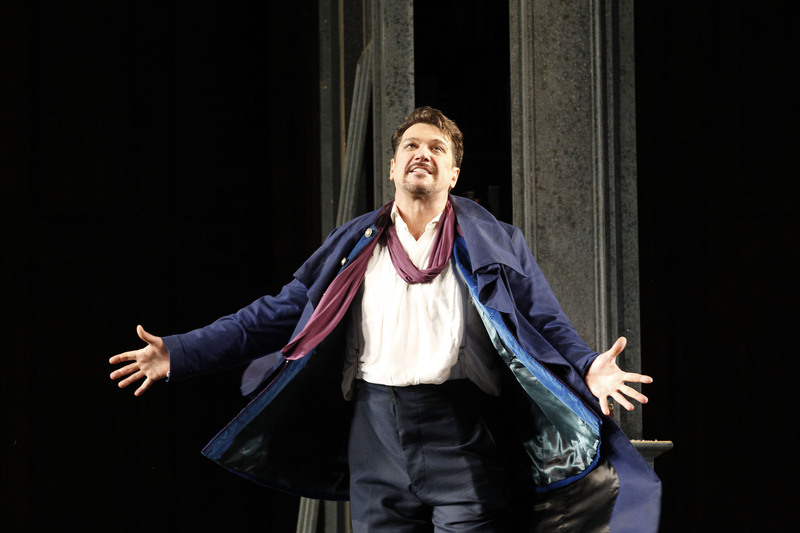 Handsome and charismatic, the Brazilian baritone performs with a commanding intensity that brings life to the slightly underwritten title role. Even when wooing an endless parade of women, as Onegin’s life continues with Tatyana and Lensky, Szot somehow maintains Onegin as an understandable and even likeable man of misery. Szot and Car are a stunning pair, the love their characters share very easy to understand given the chemistry they enjoy. Visiting artist aside, the cast is filled by Opera Australia stalwarts, giving an impressive measure of the company’s depth of talent. Watching the family of Car as Tatyana, Sian Pendry as her sister Olga, Dominica Matthews as their mother Madame Larina and Jacqueline Dark as the girls’ nurse Filippyevna is indeed an unparalleled delight, such is the level of ability, warmth and camaraderie of these exceptional singers. Pendry beams with girlish glee as wide-eyed Olga. Matthews bristles with what-will-the-neighbours-think judgment. Dark is all motherly care as the subservient Filippyevna, unrecognisable after her star turn as the domineering Fricka in Die Walküre. James Egglestone achieves a stirring intensity as Lensky, significantly contributing to the fiery first half climax. He imbues Lensky’s aria with a bittersweet balance of love and fear, making his brutal fate the more affecting. Kanen Breen proves yet again there are no small parts, adding a welcome touch of folly as the conceitedly precious Triquet. Powerful bass Daniel Sumegi grounds and energizes the final stages with clarion focus and commitment as he delivers Prince Gremin’s aria, imparting the fragile underscoring of his deep and grateful love for his younger wife. 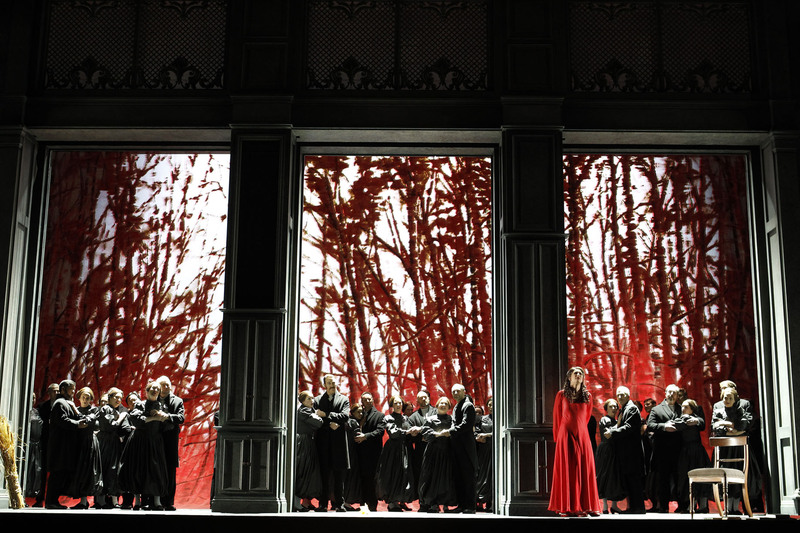 This production has done much to expunge my January trauma at Bavarian State Opera’s Brokeback Mountain–Onegin. 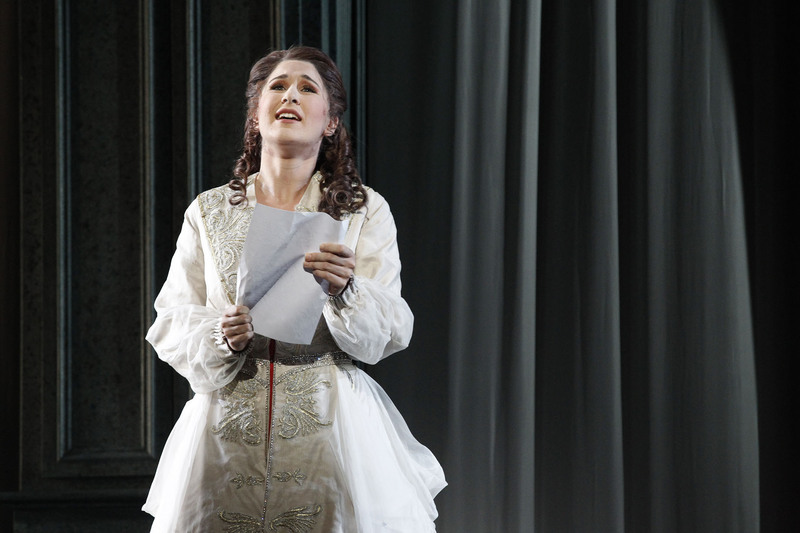 Opera lovers are strongly advised not to miss Eugene Onegin. 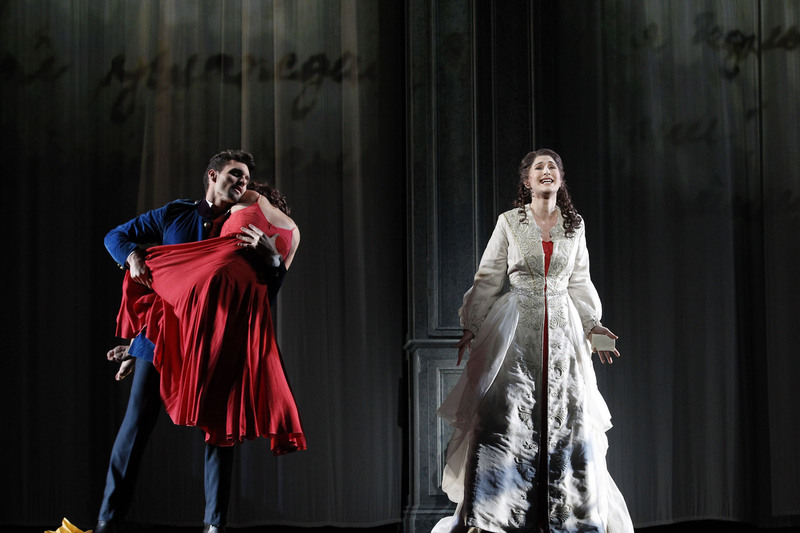 Eugene Onegin was reviewed 30 April 2014 at State Theatre, Melbourne Arts Centre, where it plays selected dates until 13 May 2014. This review published on Theatre People 1 May 2014. Thanks for this feedback. I have read your review now and your analysis is indeed very interesting. I hope other readers will check it out.